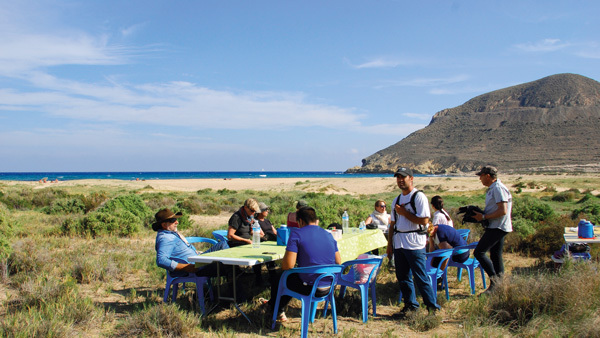 You've probably seen Andalusia's largest nature reserve, Cabo de Gata without knowing it. It has been featured as America's Wild West, the exotic Arabia and the desert covered North Africa in a large number of movies. So it is difficult to find a better location for a trail ride. Manolo is based here since a long time back. 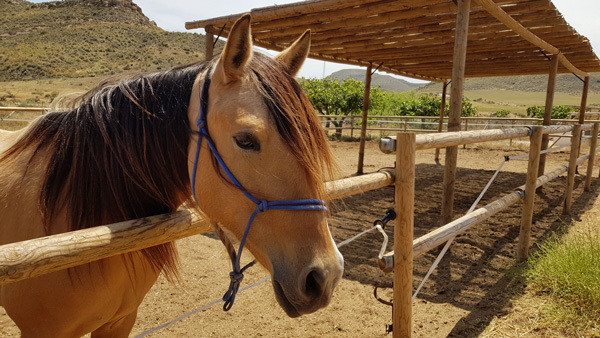 His love for people, horses and nature is evident and he describes horses as "our companions through life". 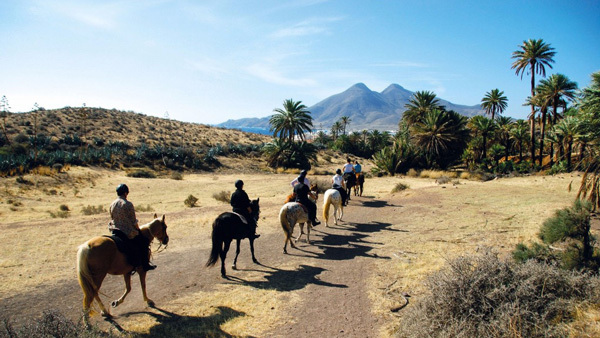 You can choose between two trail rides. On both trails you will stay at least two nights in a cozy boutique hotel in the nature reserve. 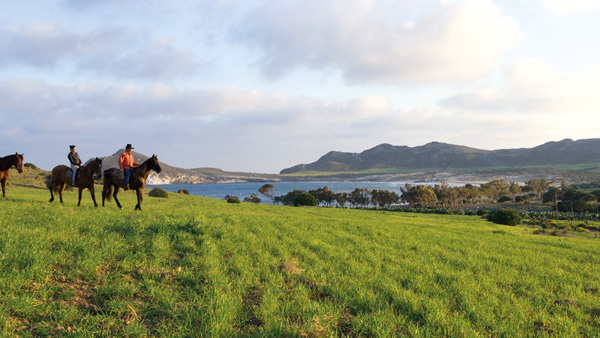 It is close to both the beach and the horses' pastures. 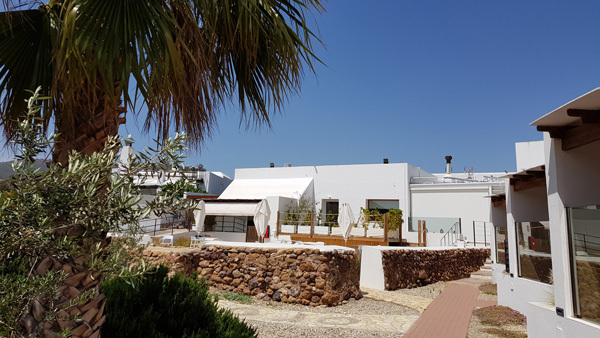 Newly built, fresh with nice pool, restaurant and bar, a place where you can really enjoy yourself. 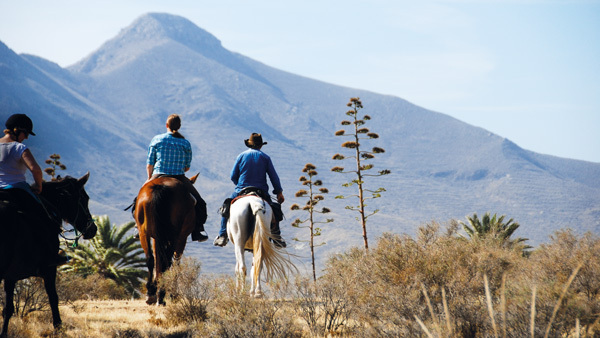 If you choose Cabo de Gata star ride, you will stay all nights at the boutique hotel and ride half dayrides in different directions. 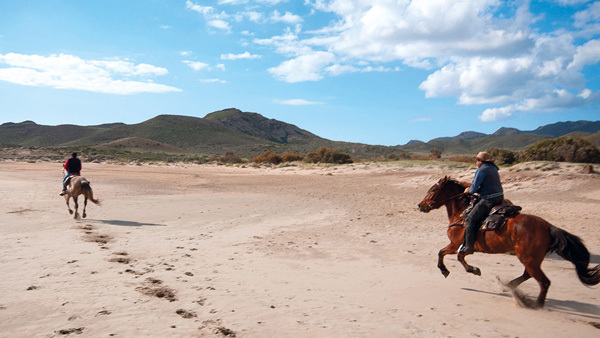 On Cabo de Gata beachride you stay at *** / **** hotels along the way. 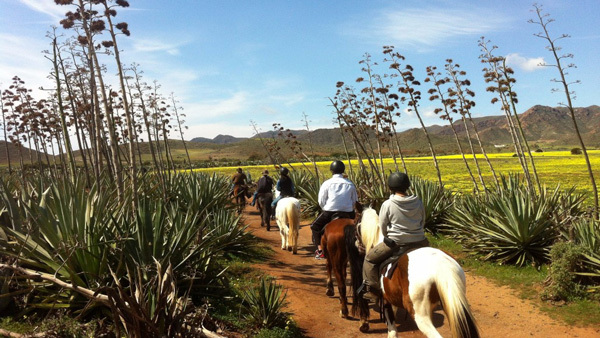 During the summer, you who are a beginner and eager to learn to ride, can choose the program Learn to ride by the sea and at the end of the week you can safely trot out in nature. If you want to experience the genuine Spanish coast outside the tourist route, you should go here! 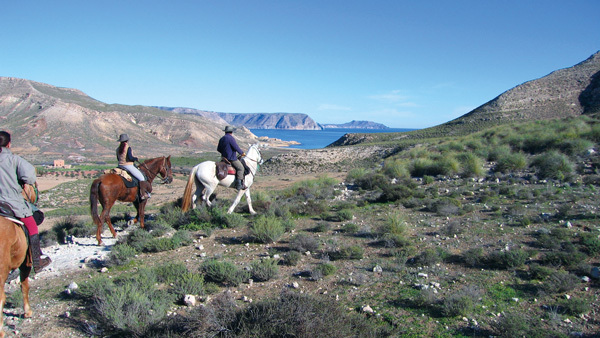 The riding is based near the Natural Park of Cabo de Gata. This hotel is situated in the village of Rodalquilar on the edge of the Caba de Gata national park. 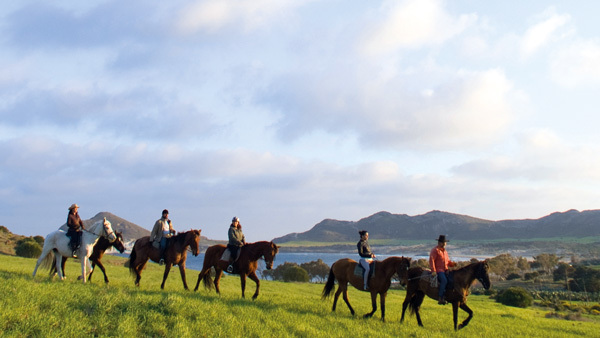 The hotel is ideally located close to the beach and within easy walking distance to the horses. The hotel is clean, fresh and modern with nice views out toward the national park and the Sierra Nevada beyond. 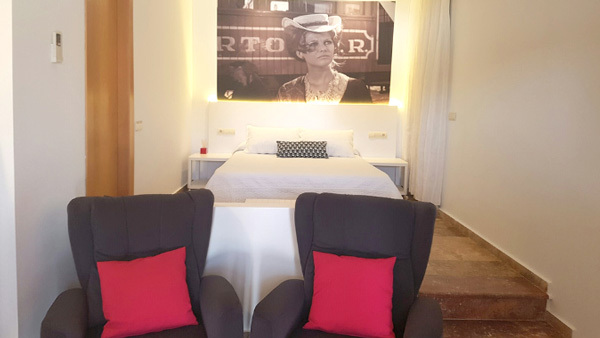 Each room offers an independent entrance, private patio and en-suite bathroom, as well as being decorated with a freeze from well known western productions shot in the region - a touch of individuality and personality in each one. The restaurant on site invites you to enjoy delicious gourmet meals in a calm and peaceful environment. 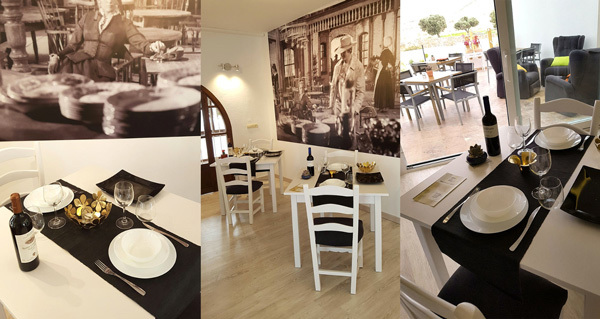 Chef Jorge will produce dishes filled with local and traditional produce and flavours. The food here is typical Spanish with plenty of fresh vegetables and fish. In the hotel restaurant they cook with many organic ingredients. 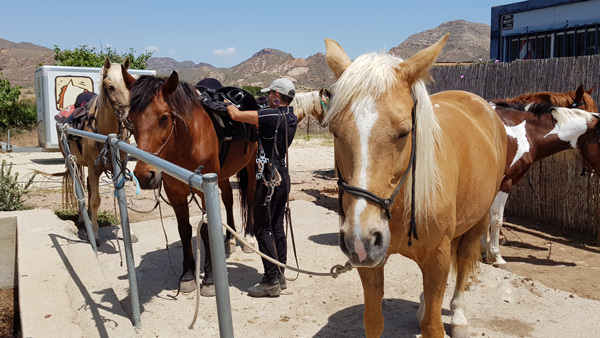 The horses are mainly Andalucian and Arabian cross breeds. 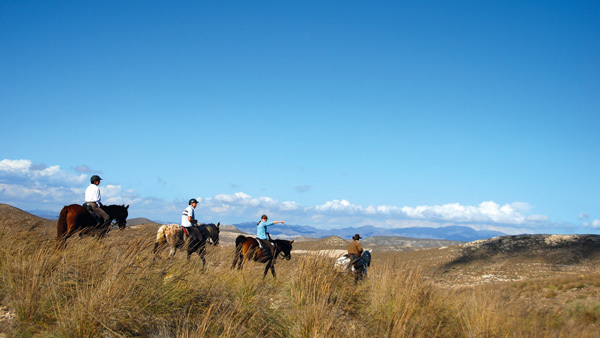 Riding ability: Trail ride level 1-3 Cabo da Gata starride. 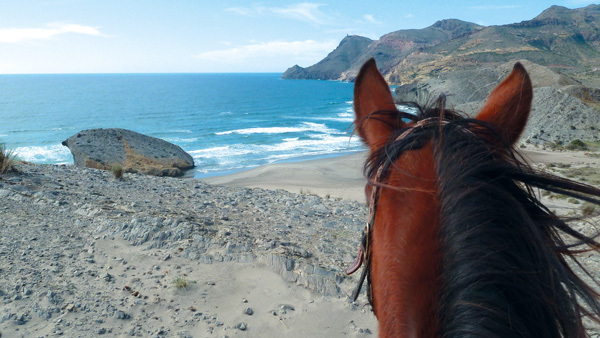 Trail ride level 2-3 Cabo da Gata beach ride. 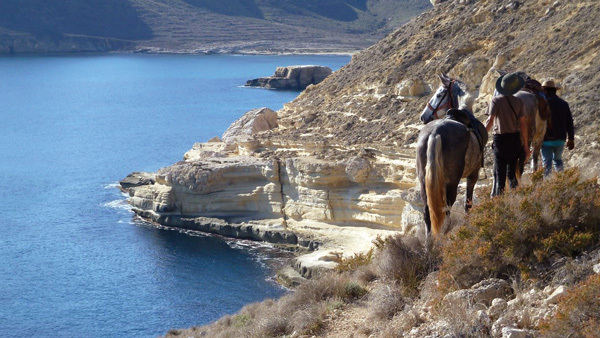 Cabo da Gata beach ride: 7 nights, 6 days riding, full board incl. water, 1 glass of bear/ wine with meals. Return transfer Almeria. 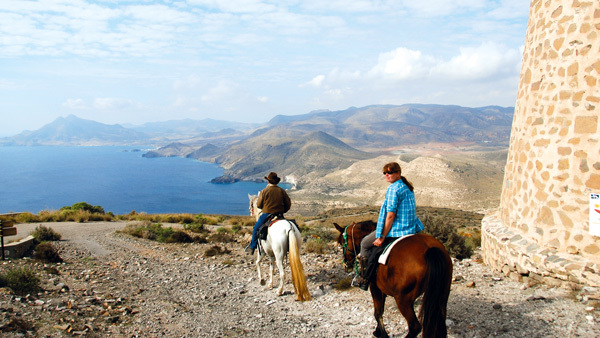 Cabo da Gata star ride: 6 nights, 5 days ridning (4 half day rides and 1 full day ride). Breakfast and 1 picnic lunch. Return transfer Almeria. 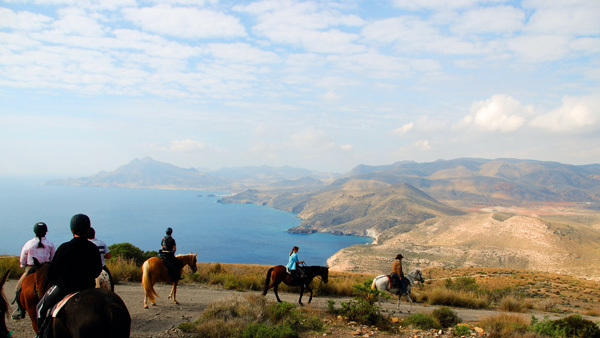 Cabo da Gata Lear to ride: 6 nights, 5 days riding (2-3 hours /day). Breakfast. Return transfer Almeria. Not included: Flight, beverages and meals except above mentioned. 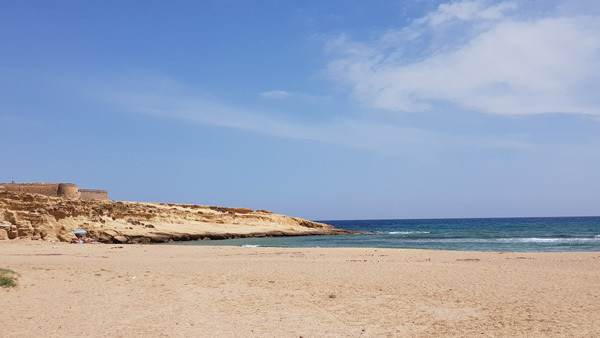 Travel: Fly to Almeria. Alternative airport Malaga. 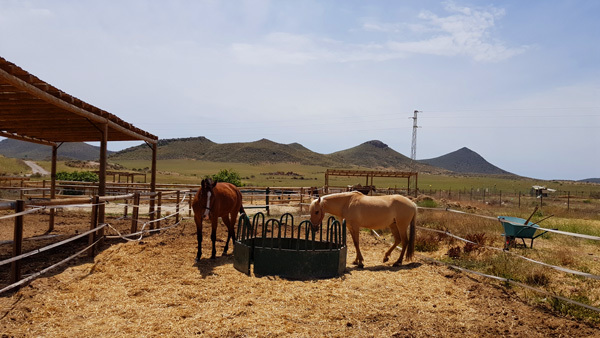 From: Almeria to the riding centre by car about 45 minutes. From Malaga to the riding centre about 2½ hours. Price: From Almeria included in the price with arrival and departure between the hours below. Transfers outside of these times will carry an additional charge. From Malaga airport 100 EUR per way per person (min 2 pers). There is a also a bus https://www.alsa.com/en/web/bus/home, between the airport Malaga and Almeria. About 2½ – 4½ hours depending on stops. Meeting Almeria. At 6.00pm in arrival hall or Alemeria bus station. Departure day at 08.30am from the riding centre. 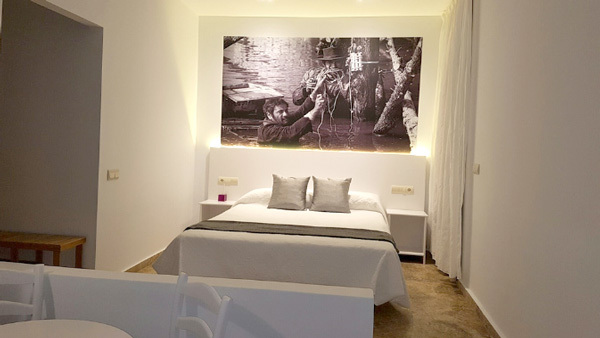 Single room: 180 EUR payable on site. If there is no one to share a room with, a single supplement will be added. Group size: Min. 4 max 10 on the trail ride, min. 2 and max 4 on star ride., min 2 and max 10 on Lear to ride. Credit card: Yes in the hotels.